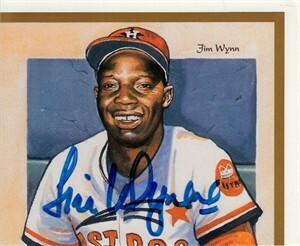 Roughly 3 by 4 inch section cut from a Upper Deck commemorative card sheet autographed in blue marker by former Houston Astros superstar slugger Jim Wynn. Obtained in person, with certificate of authenticity from AutographsForSale.com. ONLY ONE AVAILABLE FOR SALE.